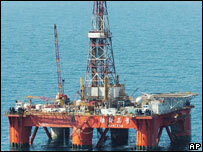 Japan has begun allocating gas exploration rights in an area of the East China Sea also claimed by China. The move is likely to anger Beijing, at a time when tensions between the two nations are already rising. Violent protests took place in China at the weekend against Japan's approval of history textbooks, which critics say play down its wartime brutality. Japanese Foreign Minister Nobutaka Machimura is travelling to Beijing on Saturday to try to resolve the row. According to a BBC correspondent in Beijing, Louisa Lim, the rivalry between the two countries as they jostle for supremacy in Asia is at the heart of the tensions. In a statement on Wednesday, Japan's Ministry of Economy, Trade and Industry said it would begin reviewing applications from companies that wanted to explore the disputed gas fields. Government spokesman Hiroyuki Hosoda insisted the timing of the decision had nothing to do with the escalating row between Beijing and Tokyo. "It just happened that awarding exploration rights began today," Mr Hosoda told reporters. Japanese companies have been waiting for 40 years to be given the go-ahead to drill in what it sees as its exclusive economic zone (EEZ), which has a potentially vast reserve of natural gas and oil. Both China and Japan are heavily dependent on imported energy, and both are seeking new sources of energy to power their economies. In recent years China has conducted surveys of the disputed area, and has refused Japanese requests to stop or provide details of its research. Now it is China's turn to be annoyed. Japan's decision to allocate drilling rights in the region comes just one day after Beijing warned Tokyo against precisely such a course of action. In the past Beijing has made it plain that the East China Sea dispute is an important one, characterising it as one of the main bilateral sticking points with Tokyo. Even before Wednesday's announcement, ties between the two nations were already strained, after Japan approved a series of school textbooks which critics say gloss over its wartime atrocities. On Saturday a 10,000-strong gathering marched in Beijing to voice their anger at the textbooks - the city's biggest protest since 1999. The protests then spread to other parts of China on Sunday. Correspondents said the scale and ferocity of the unrest were unusual for China, and indicated tacit official support for the protesters. Since the weekend's unrest, both nations have used public and diplomatic channels to trade accusations over the row. On Monday Japanese leader Junichiro Koizumi described the attacks as "extremely regrettable", saying that Beijing should be responsible for safeguarding Japanese interests in the country. On Tuesday, Chinese Premier Wen Jiabao hit back, telling Japan to "face up to history" and admit the suffering caused by World War II. Mr Wen also said the weekend's protests should prompt Tokyo to "have deep and profound reflections" on its bid for a permanent UN Security Council seat. 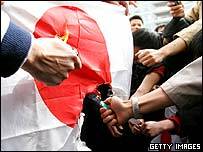 But on Wednesday Japanese spokesman Hiroyuki Hosoda said "Japan has reflected deeply on its past... There is no change to that position."